So I'm skimming eBay and Craigslist tonight, looking for some "Weekend Quickies", when this car shows up. Cool. I like 124s. 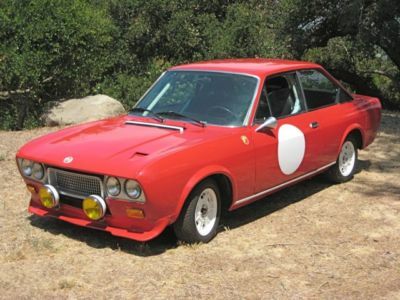 I start reading the text... "The Fiat 124 CC Coupe was the last and third version of Mario Boano's brilliant design for Bertone and I believe the best. These cars were very popular in their day and are virtually non existent now with less than 1000 accounted for worldwide. Anyone who knows these cars will attest to the fragility of the metal, hence the reason why so few survive." All pretty interesting, informative and typical stuff. Then I read the next line... "This obviously is a tribute car that I have built over the course of 4 years hoping to rally race but must sell now in order to open my medicinal marijuana dispensary." This is a really nicely done car. 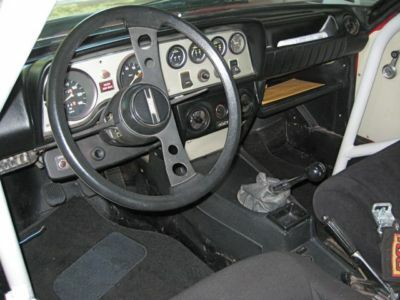 The seller restored the body, removing the bumpers and adding a pair of NACA style hood scoops in the process. It's been lowered and now sits on a set of Cromodora wheels that were media blasted and powder coated. The Cibies in front look great. The interior was also redone with a set of racing seats and a 10 point roll bar. All-in-all, this is a really cool car, one that would be great to bring to local rallys or track day. This is a no reserve auction. If this were my car, I'd keep it and find another way to fund the business. This would have to be the coolest marijuana delivery car ever. It would beat the hell out of a "donk". Located in Ventura, CA, click here to see the eBay listing. Just today at Lime Rock Teddy Panagiotou won his class with a 124 coupe. Eastern Motor Racing Association time trial event #2 for 2010. Teddy's car sure could use the cosmetics from this car!! !He runs a pair of 40 DCOEs and uses the 9 pound(!) campagnolo wheels. See emraracing.org for pictures. Correction, Teddy Panagiotou was second at Lime Rock, not a winner.